The Creekside Paradise. You won't want to leave this private enclave reminiscent of wood and glass chalets along the creek in vail. The creek runs right by the house with a little waterfall, island in the center of the creek accessed by a wood bridge. Owner is renouned San Fransisco designer. Ugraded, luxurious but cozy and warm. Not like typical rental. Two master bedrooms have private baths. 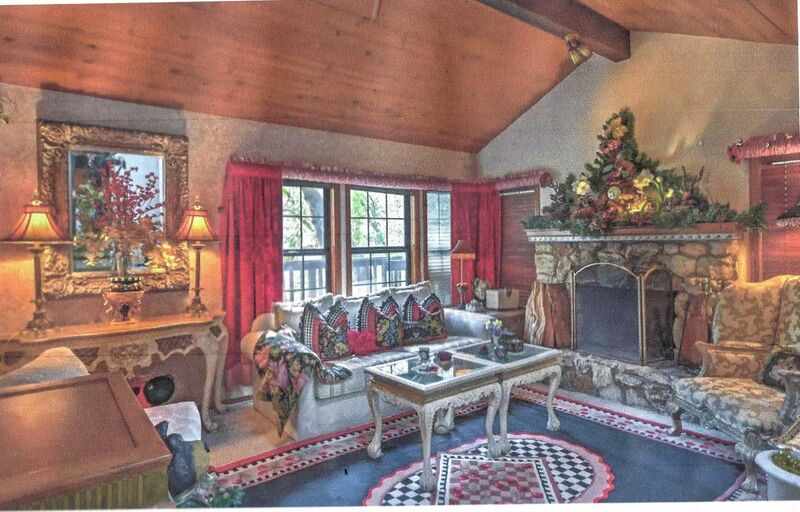 Main master has romantic king canopy bed, fireplace, seating area, jacuzzi and separate shower. 2nd master has queen. 5 star comfort and enjoyment. The home is set on a private heavily forested acre both natural and manicured with flowers abundant. There are many seating and dining areas on the grounds and next to the creek. Mountain subdivision has beautiful forested golf course and restaurant/ clubhouse all accessible to guests. Home is single story with an open concept great room with cathedral wood ceiling and large stone fireplace. (Wood provided.) Three steps up to bedrooms. Very large deck has stairs to yard and creek. Deck has beautiful table for 6 and barstools at kitchen outside counter, wrought iron chaise and rocking chair, and bar table with two stools. WIFI. Circular drive for ample parking. Perfect place for a small wedding. Nuptials on the island in the center of the creek with dining in the yard along the creek. Catering, music, photography available. The master is the ultimate honeymoon suite. Pictures of weddings available. Spacious yet inviting great room with pop up (by remote control) cable TV hidden in cabinet, fully appointed kitchen, 3 baths, 2 bedrooms, laundry, dining area seats 4- 6 (8 upon request), breakfast bar seats 2-4. Flowers abound on the deck in summer with a mple seating. Deer visit usually daily along with racoons, squirrels, abundant bird species and a blue heron. On summer nights, keep windows/slider open and let the creek lull you to restful sleep. Or lay on the deck in the chaise for an afternoon nap after aperitifs on the island in the center of the creek. Paradise! Fully appointed. Corner sink window looks on to deck and creek. Custom tiled bear mural above gas range. My Husband, 15 year old and I rented this house for 3 1/2 days and 4 nights. We spent two full days at the Celtic Festival there in Grass Valley but slept at the house at night.. The other days we were able to be at the house the whole time. The house is very charming and and very comfortable. We were surprised by all the knickknacks and I think the first day we must have spent a good hour just looking at all the knickknacks. Absolutely charming! It very much reminded me of my Grandmothers house. We enjoyed an evening down in the seated areas which was very nice. We love waking up to seeing a family of deer looking out the bathroom window. It was funny as our 15 year old refused to sleep in the bedroom that would have been his. He didn't want to wake up with deer's staring at him or (Big Foot) as he put it. We were very surprised by that but the couch was very comfortable to rest on. The toilets were a surprise and I will leave it at that but nothing bad, just interesting. We would recommend this property. I have a feeling at Christmas it would be amazing and I have a feeling the owner would add that holiday charm! I would like to say Thank you to the owner! We liked it a lot and hopefully will be back. Thank you Kathy! Pretty property, art all around. Overall experience was great. Ms. Kathy was very helpful with anything i needed. Kathy’s home was exactly as pictured, beautifully decorated and with an amazing peaceful backyard on a creek. Be careful with young children, there’s a lot of small breakable. Makes the house beautiful but you just have to make sure to watch your kids well so nothing gets broken. The bed was comfortable, good central location and we enjoyed our stay. Thank you! 1800's wild west mining towns of Grass Valley and Nevada City fun to explore with great shops, restaurants, wine tasting rooms etc.